Equipment: PW 12.5" w/ SBIG ST 10XME . RGB at 20 min each bin 2, with Lum at 30 min. 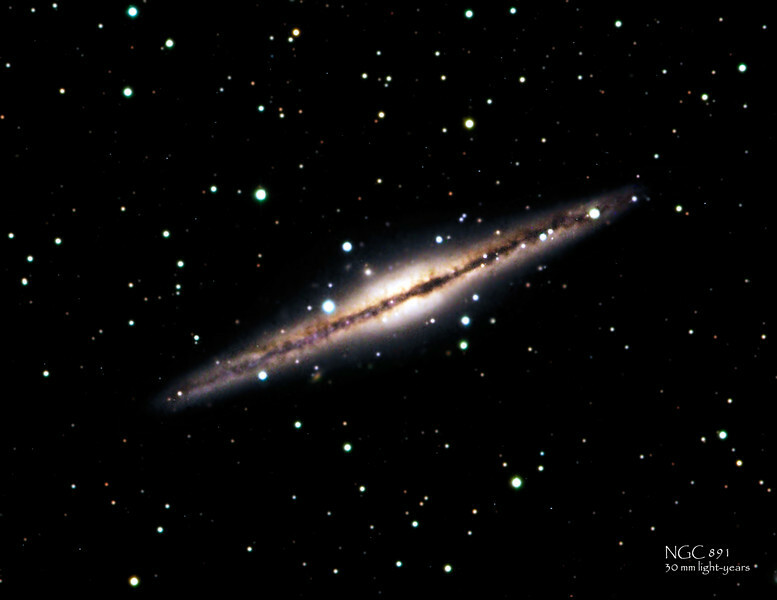 NGC 891 is an edge-on spiral galaxy (actually barred) about 30 million light-years away in the constellation Andromeda. The galaxy is a member of the NGC 1023 group of galaxies in the Local Supercluster. It represents what astronomers believe is a reasonable facsimile to what the Milky Way would look like if viewed edge on. The galaxy is visible in small to moderate size telescopes as a faint elongated smear of light with a dust lane visible in larger apertures.